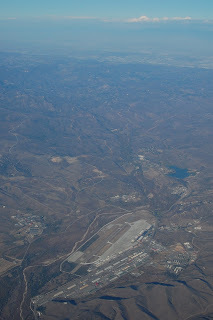 Camp Pendleton is a Marine Corps base, stuck between the I5 along the Pacific ocean, and the coastal mountain range. It has a huge cache of military helicopters sitting out in the California sun. It's also a strategic site for locating the San Clemente Border Patrol interior checkpoint, which is cheerfully documented for all in a GAO report (p55-62). Northbound traffic on the I5 is profiled and questioned for immigration violations. Illegal immigrants must appreciate the detail when planning a strategy to evade the enforcement!